I started by attaching my book pages to my art journal with matte medium. I then created a whitewash, using gesso and water, to brush across all of the pages. My next step was to apply gold paint, I used Dina Wakley's Gilt paint on these pages, to all of the edges. I also went over all of the edges with Gathered Twigs Distress Ink. The small mailing tag is one that I had in my stash and I simply added a date stamp, inked the edges, and attached some twine and a heart. The tiny heart is from the new Wendy Vecchi Mat Mini - Hearts collection. 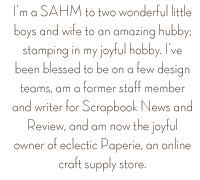 Her mat minis are shapes die cut from an extremely strong chipboard that can handle paint, ink, heat embossing...anything! I just cover this one with gold paint, applied with my finger, which gives it a nice textured look. The gold letters were in my stash, and following a tip from Donna Downey, I painted the sheet of letter stickers with gesso and then gold paint. What do you know...gold stickers! What a great idea! This week's lesson included lots of layering, which is love, and so I added lots of layers behind the photo. This is a great way to use up paper and ribbon scraps, pieces of tags, tissue paper, and I even threw in some punchanella that I found in a bin. The little forever banner was a paper banner that I painted with more gold paint. I stamped the word on using tiny alphabet letters. My last step was to add just a few gold paint splatters...'cause every good art journal pages needs paint splatters! Hello crafty friends! I'm popping in with a few quick and simple cards that I created last week, featuring stamp sets from Sweet 'n Sassy. Since I needed two cards, and since this girl is short on time lately, I opted to keep both designs simple. I even used almost the same layout on each. And with any CAS card...keeping things clean, white, and bright is a great option. My first card features an older Sweet 'n Sassy stamp set, Rose Collage. This set includes the rose collage image, along with two butterflies, and a host of sentiments that fit perfectly inside the ribbon image included in the collage. I stamped the image on watercolor paper and then used Distress Markers to color the image. This is the first time I used a deep purple for the shading...and I love it! It seems to give much more depth vs. a black or gray color. For more depth, the butterflies were stamped on a scrap piece of paper, colored, fussy cut, and attached to the main image. Then I just cut out the image, leaving a small white border, and used foam tape to attach to the front of the card. The second card showcases the sweet Little One stamp set that includes a darling hand and feet image along with a baby carriage, a rattle, a few heart images, and a host of new baby-inspired sentiments. After cutting four small squares (1.25"), I used watered down paint to add some paint splatters, and then added the silhouette images to each square. I left the fourth square empty so I could attach the sentiment. The squares were added to layers of designer paper and attach to the card front. This card got a tiny bit of bling in the form of tiny pearls. I also added a few score lines at the bottom of the card for visual interest. I hope you enjoyed both of today's cards and are encouraged to embrace the clean and simple design..it makes for a joyful card creating experience! Greetings all and welcome to the next installment of Inspiration Wednesday! I have to tell you...I love when each new lesson rolls around. I love watching Donna's videos...she's a hoot...and this week we got to see her struggle with what steps to take next in her journal. Maybe some people enjoy a very polished video, I adore seeing her creative process played out on the screen. For me, it's encouraging and inspiring! When I first created my background, with just a yellow and blue band, I was really hesitant to add the pink, which was added using a glazing medium. However, once it was finished...swoon...love those pink accents. Totally fun! Enter the torn tag...but the bottom part instead of the top. I think you'll see, in the lower right hand corner, where the bottom of the tag came from. *wink* All of the pink numbers and quote were created with Wendy Vecchi's embossing paste (the best out there!) and the glaze. The stencils are almost all from Donna Downey. Final page with a tag, some random numbers, lots of layers, and small words. Oh, and tiny pieces of washi tape. Another fabulous week completed! Links to where you can purchase products below. Happy crafting! Hello there, crafty friends and welcome to Monday! 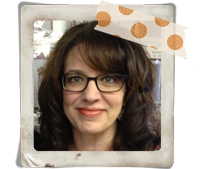 I'm super excited to share a new project with you today, which features many of Wendy Vecchi's newest products! WooHoo! (The crafty fairy sent me a box of goodies to play with...she's the BEST!) You can find links to all of the products used in my project listed at the end of the post. The first new product? Wendy's new Mini Mat Fat Little Book! This darling little book features four mini pages (4.5" x 4.5") made of mat board, which is a very heavy duty material that can stand up to whatever you throw at it (no, you can't cut it! ), paint, glue, ink, you name it. I painted the front and back covers of my book with black gesso and then used the Checkmate stencil and a baby wipe to remove some of the paint. Once that layer was dry I mixed Wendy's embossing paste with Dina Wakley's Gilt paint to create gold paint. (And, yes, using Wendy's gold embossing paste would work just as well!) The paste was applied using the Classic Words stencil. When the paste was dry I got to work on my decorations. The front cover features the new Stamp It, Stencil It set Mirror Flowers. I stamped the larger flower three times to create lots of dimension. (There's also a bit of stamping seen on the text oval, behind the flower) The sentiment is from the new Birds for Art set and the tiny hearts is from the Just Say It background stamp (yes, I cut apart all of those fabulous sayings!). I opted to use my album as a photo album showing off my three favorite guys. Because the majority of our photos are now in digital format, it's nice to actually print some out and put them in an album that you can look at regularly. Since I had a lot going on in the background of each page, I opted to keep the photos black and white. Love that contrast! These first two pages feature a leaf stamp from the new Blooming Art stamp set, and seriously, this leaf stamp is going to show up on everything I make...love this image! The bird and birdhouses...are they not to die for...are Wendy's new Mat Minis, which perfectly coordinate with the Stamp It, Stencil It Put a Bird on It set. Stamping the details on to the chipboard is so much fun! This has to be my favorite product from this latest release. The sentiment on the left is from an older set and the one on the right is from the Blooming Art set. Next up we have more mat minis! The hearts, which were colored with Distress Ink, covered with polka dots, thanks to the new Lots of Dots stencil, and coated with Glossy Accents look so cute popping out of that tiny envelope, from the Birds for Art set. The buttons on the right are also new Mat Minis. I simply colored them with Distress Inks and used some random stamps to add decoration. The sentiment, that I slighted altered, is from the Just Say It background stamp. The next two pages are all about stenciling. I used the the Fence & Foliage stencil along with the older Layered Tree stencil. The stars are even from a stencil! I just inked the stars, from the Little Bits stencil, with Distress Ink on a piece of cardstock and then cut them out. The bird is from the License Plate Art stamp set and the sentiment is from an older set. Want to get your hands on the new Wendy Vecchi goodies? The Funkie Junkie has everything you need! Products should be shipping soon and get your order in now! Follow the links below! Enjoy and happy crafting! Sometimes you need a card and you need it quickly! One layer cards to the rescue! Today's card was created in a matter of minutes using just a piece of watercolor paper, inks, and stamps. First, I used a blending tool and Distress Ink (Scattered Straw) to cover the entire piece of Ranger watercolor cardstock. Next, I added more layers of ink...Rusty Hinge, Fired Brick, Ripe Persimmon, and Gathered Twigs. To keep the ink blending smoothly from color to color, simply rub back over the entire piece with your lightest color, in this case Scattered Straw. Add a sentiment and attach to a pre-cut 4.25 x 5.5 card base and my card is ready for mailing! Hope you enjoyed today's quick and easy card...be sure to check out the product links below to grab your fav products from this project.